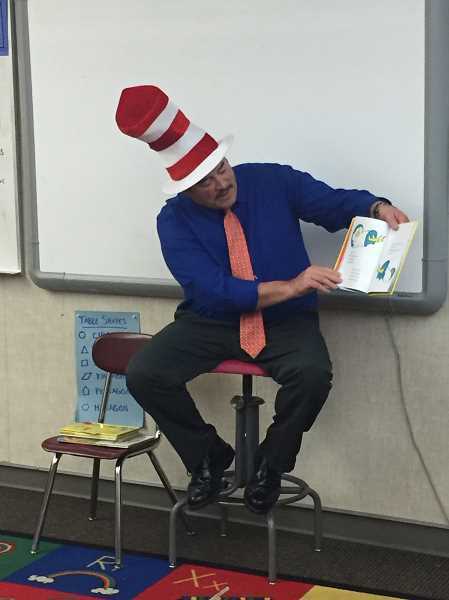 Estacada's mayor Sean Drinkwine wears many hats, and on Wednesday, Feb. 28, he donned the iconic red and white headgear from Dr. Seuss' story "The Cat in the Hat" as he read to students during the Clackamas River Elementary School family fun night. Drinkwine read several stories, including "One Fish, Two Fish, Red Fish, Blue Fish" and "Mr. Brown Can Moo! Can You?"